Tourism has an international aspect to it and it may imply online reservations. So it couldn't not have been one of the business sectors most present on the web. According to Think with Google 2013 Traveller insights, 68% leisure travelers began researching online even before knowing where they want to go. Considering these figures, we must face the facts: creating a tourism website is a must for all the professionals of this sector. provide all the useful links. 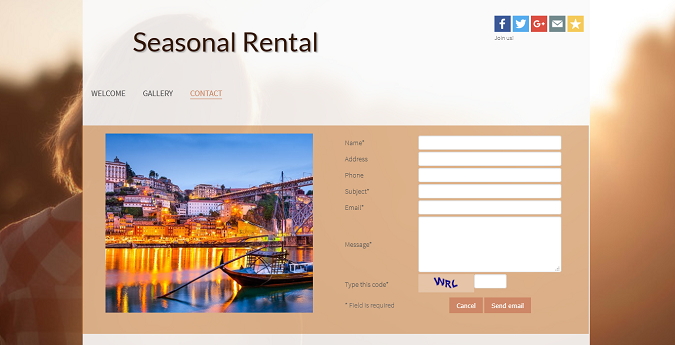 Your homepage must be attractive and make your visitors stay on your rental website. For example use beautiful photos and convincing words. With SiteW Image block, you will be able to add pretty pictures to the various pages of your accommodation website. The Gallery block will allow you to create all kinds of galleries to show all the details of your rental. Adding a video may also be a good idea. You can easily add a video with our Video block. You can add videos showing the landscapes or the leisure activities that can be found in your local area or even a film presenting your hotel, your guest house or your rental. in 2013, 46% of leisure travelers, and 68% of business travellers chose a destination based on videos they have seen online. The Full screen option will allow you to display your video across your screen. Refine your value proposition: this can be an engaging text like “Here starts your holiday” or “Join us in paradise”. And don’t forget to insert your calls to action right on the homepage. They must be highly visible. Remember to add a map to your rental website, this will allow your customers to easily know where you are located. With SiteW Map block, you can add a Google map in just a few clicks allowing to easily locate your guest house or your b’n’b. Remember to add links and give information concerning restaurants, tourist sites, leisure and events calendars of your town. You can for instance add a weather widget to your site that will inform your visitors about the weather forecast of your location. Place the important information above the fold (what is visible before the user has to scroll). Keep in mind that the top left area is the most read area. The questions that you have to answer in this area are: what is this website about? What can I do on this website? Is it relevant to me? 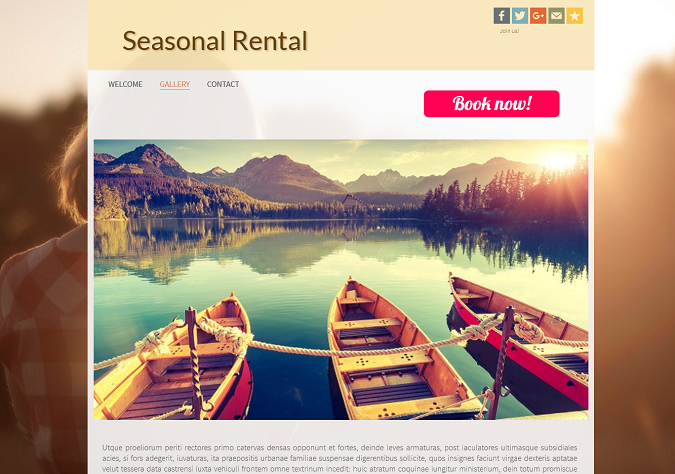 Make sure that your b&b website or your campground website is updated and attractive: highlight your brand image, thanks to our Widget blocks. Remember that your tourism website is determining and will have a big impact on your prospects’ first impression. Thus it certainly has an impact on your number of reservations too. Your visitors must be able to easily find information, hence the importance of creating a tourism website that is clear and not cluttered. Try to keep a sober and neat design. Make a special Contact page so that your visitors can easily contact you to ask for information about reservation. It can be useful to add a calendar in which you can insert the reservations that have already been made. It is important that your prices are clear: how much does it cost? What do we get for this price? Why this price? Your prospects should easily find the information they need. Try to segment your information and separate it into pages and paragraphs. To do so, you can add separators thanks to the Widget block or even add drop down menus. Be objective and precise. This will moreover improve your SEO. Don’t try to over-value your service by over embellishing it, don’t fall into the trap of making exaggerated advertising claims. Work on your content strategy: add new content and update old content. In this context, adding a blog can be a good idea to add new pages on a regular basis. Note that, with SiteW, you can add meta descriptions to your blog pages. As far as texts are concerned, you can read our articles How To Write Web Content: Find Out Our Blog Writing Tips or How To Use Keywords For Search Engine Optimization? We advise you to write clear and concise texts with short active sentences and to use lists. The important words should be in bold or in italics. You can add links but take great care of the link anchors of your rental website: they must be relevant. Your community will have an impact on the word of mouth concerning your products and services. Insert a Social block on your website that will allow your visitors to share your tourism website on social media. Start a conversation with your prospects. Ask their opinion in your blog for example. Talk about yourself, your story, your passion: why have you created this rental? What does your daily life as a rental manager look like? Observe and analyze the stats of your rental or guest house website: number of visits, bounce rate, conversion rate… thanks to free tools such as Google Analytics, you will be ble to easily improve your campground or your hotel website. Finally work on Competitive intelligence. Don’t hesitate to read our articles on the topic to help you take advantage of this method, in order to attract prospects and satisfy your customers. 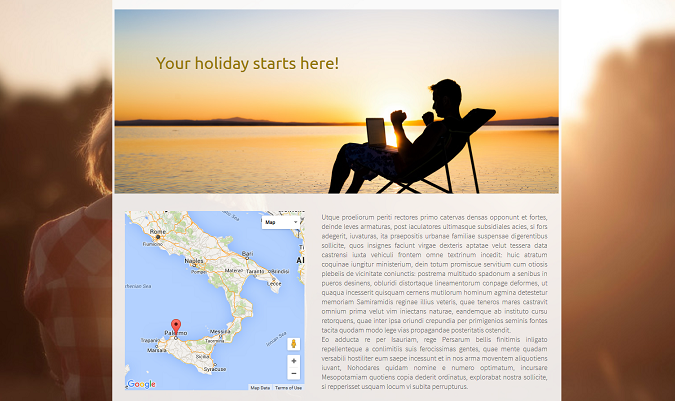 You now know all the essentials to build a tourism website. Now that all rental managers must ensure their presence on the web, following these simple tips can give you a edge on your competitors.